Children begin communicating long before they learn verbal speech. For children with complex communication needs, speech often does not come at the time or in the way that the family expects. The family begins to understand a child’s non-verbal communication, gestures, cries, and squeals, but they never truly know what their child is thinking or what they want or need. Parents do their best to guess and attend to all of a child’s basic needs, but without speech, a large part of their child is unknown to them. Thanks to the many technological advances, Augmentative and Alternative Communication (AAC) is now more widely available and easily accessible. AAC devices allow a child to express their wants and needs in so many ways. There was once a time when dedicated communication devices were so expensive that families could not purchase the one thing they needed for their child to become part of the world around them. There are now an abundance of Speech applications for iPads, Androids, and other tablet devices, in addition to the many dedicated devices used for AAC, available in nearly every price range. Access to high tech communication is now easier than ever. We have had the pleasure of working with many families whose lives have been enriched by AAC in some way, shape, or form. Today, we are sharing the AAC journey of our friend Joshua. I am one of the many parents out there who felt like my speech-delayed child had so much to say, but very few ways to express himself. My son knows some basic ASL, which helped to reduce some of the speech barriers, but I still often found myself wondering what he was trying to tell me and if he had more to say. His speech therapist suggested we get a Dynavox device, but unfortunately we could not go that route due to the price of the device. 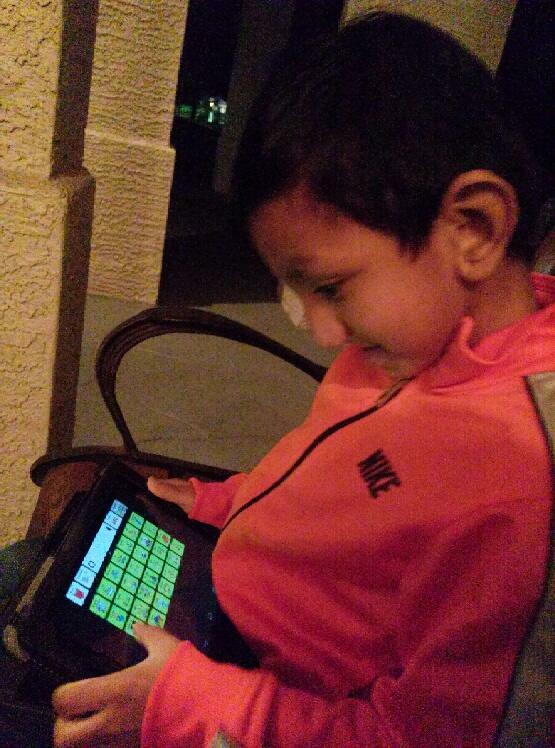 Fortunately, we were able to take another route and we bought my son a small tablet with the Tobii Sonoflex App. We are so thankful that his speech therapist suggested we try out an AAC device. Tobii Sonoflex has helped my son to expand his communication, learn, and even socialize at school. My son carries his tablet to school everyday and I’m happy to say that he loves it!! I forgot to send his AAC device to school one day and his teacher wrote a note asking if I could please send the device to school the next day, which shows me that they, too, benefit from this device. Tobii Sonoflex is user friendly and can be customized to your child’s needs. The AAC device has even encouraged my son in his potty training. His favorite customized button is telling us how old he is and what school he goes to!! I love how the AAC device puts a different kind of smile on my sons face! Josh was the ideal AAC candidate for a speech therapist. His receptive language skills were above average and his ability to communicate nonverbally via sign language, facial expression, and body language was incredible. Josh was also very savvy when it came to any electronics, as most children are these days! I initially spoke with a Dynavox representative regarding their new Compass software. We reached out to several resources for funding with no luck. After a summer of unsuccessful attempts for funding, I began looking for more affordable options and found Sonoflex by Tobii Software. 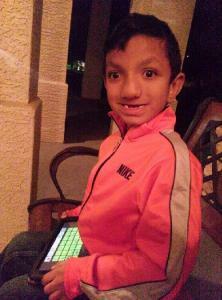 We were able to get Josh an Android tablet with this communication application just in time for school. I remember the first time I brought the tablet back to Josh after customizing it and adding pictures of family members, his favorite toys, personal needs, etc. Within 15 minutes, Josh was able to tell me his name, age, school, and tell his mom he loved her. It was truly incredible how AAC helped my friend Josh effectively communicate things he has been wanting and trying to say for years! This is only one of the many stories I could tell justifying the confidence and freedom AAC gives so many of the children I have been fortunate enough to work with. Happy AAC month! Because of Augmentative and Alternative Communication Joshua can now truly be part of the world around him and express himself in so many ways. 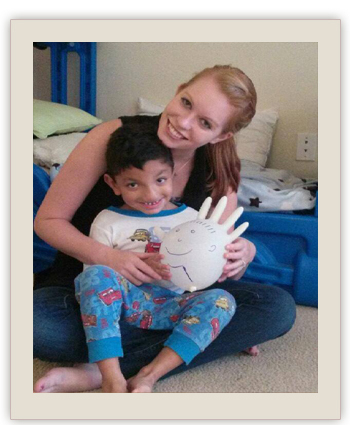 It is so wonderful that Joshua’s family had so many options available to them. When one option did not work, they did not give up. New apps are added to the app stores almost daily and each has their pros and cons. It is best to work with your Speech-Language Pathologist to find an app that is best for your child. Remember, there is no one-size fits all for AAC! That is the beauty of technology. Every app caters to a different child and the same app can be used in many different ways for different children. The important thing is to start and immerse yourself and your child to unlock everything they have wanted to say for so long. Tagged aac awareness, augmentative and alternative communication, because of aac, tobii sonoflex]. Bookmark the permalink.